Early fall sunshine streamed through the window. I sat tucked in my favorite niche, a window seat built into a dormer in a spare bedroom turned library. My feet were heavy blocks of ice despite the unseasonably warm day and thick wool socks. I angled myself so I could I sit cross-legged and wrapped a fleece throw around my legs. The house had settled into a comfortable silence with Jim away for a weekend work-retreat. He’d offered to take me, almost winning me over with his, “C’mon Honey, the leaves will be at their peak color,” not to mention his bedroom eyes, but I’d declined. The thought of walking around the resort and the shops alone left a chilly, hollow feeling in the pit of my stomach. I much preferred to be alone and by myself instead of alone and surrounded by strangers. My cat, Mocha, appeared at the open door and looked in at me, her eyes a piercing green against her dark, mottled tortie coat. She started and trilled a meow as if surprised she didn’t have the entire house to herself. I patted my lap and kissed the air, but she turned away with an aloof twitch of her tail and continued on her rounds. What am I, chopped liver? I chuckled at my joke. Apparently not. If I were, maybe I’d get a bit of affection from my own cat. I sighed, somewhere between a disgruntled huff and wistful exhale, and resigned myself to whiling away the afternoon with the triple-threat combo of romance novel, chocolate and red wine. My phone chirped, startling me. I looked at the screen. I took a sip of wine, closed my eyes and drew a centering breath. “Oh, just fine,” I said, keeping my tone bright. I opened my eyes and turned my gaze out the window. There was a soft breeze shifting through the tree branches that created dancing patterns of shadow and sunlight across the yard. Mocha peeked into the room again and meowed loudly, demanding my attention. I patted my lap again, but she just stood in the doorway staring me down. I began to open the door, Mocha’s nose pressed up to the opening. “So, I have some news,” Mom said. I froze. My stomach reacted to the cautious tone by churning the wine and chocolate already digesting there into an acidic froth. Mocha wedged her head into the widening threshold, I released my grip on the doorknob and she slipped out. “Your cousin Jessica had her baby!” Mom’s voice sounded happy but reserved. I closed the door and turned, leaning my back against it. Mom rattled off that it was a girl, her weight and roughly the time she was born, yesterday afternoon sometime. Harley Rose was her name. The family would be getting together next weekend. I felt the unspoken expectation that I be there so I could meet and fawn over my new cousin. And, that’s when it became real. Suddenly, my throat thickened and my eyes burned with unshed tears. I swallowed a sob like a chunk of grizzled meat. I was happy for Jess, really. But, an oppressive sense of regret welled up inside me like an icy stream trying to break the surface. It wasn’t so much that I had tried to have a baby and failed. It was that I hadn’t tried at all. And now, the opportunity had passed me by. An only child, with no children. The end of the line. I swallowed against the stickiness in my throat, tasting acid and chocolate and salt. I mourned less for the child I’d never had and more for the experience of being a grandma that my mother would never have. My heart squeezed at the thought that the baby Mom would rock in her arms would not be mine. She said something, snapping me back to the present and I gasped a breath I hadn’t realized I’d been holding. “Do you have her address?” Mom asked, all motherly business now. “Love you too, bye.” I ended the call and fought the urge to sink to the floor. I stood there for countless moments, my dark thoughts circling like scavenger birds around the festering corpse of the long-ago dream of having children. I heard Mocha meowing at the door and I sighed. I opened the door and looked down to see her stepping over her fresh kill before slipping inside. I turned to see her walk into the kitchen, the curl of her dark tail the last part of her to disappear. “Dammit,” I muttered. It was a chipmunk, intact thankfully, laid out like a supplicant on a sisal altar. I set my phone on the entry table and slipped into a pair of Jim’s work boots. I bent down, picking up my welcome mat and its guest as I rose. I carried the mat to the back yard and stood before the drainage ditch the briefest of moments before flicking the mat and sending the carcass tumbling down. My chin trembled as hot tears rolled down my cheeks. I sucked in deep shaking breaths, forcing emotional composure. I would have to battle those demons at some point, I couldn’t avoid Jess’s baby forever, but I had bought some time to construct my armor. So, for now I would return to my window and smother my sorrows with chocolate and wine. Finally outside her den, it took a while for Sheahanna to regain control of her energy. Scratching on a tree trunk helped. With her claws still in the bark of the tree, she pulled a long stretch, easing the last of her tension. It was a relief, especially after a frustrating episode telling the Master to make the opening. The Ground Dweller’s noises had stirred in the depth of her being, waking the instincts of her predatory ancestry which dozed just behind her consciousness. Sheahanna slipped quietly around the perimeter of her territory, making fresh marks along the way. Members of her former pride had tracked her here and she wanted to make sure they knew this was her region. Soon, she was within sight of the Ground Dwellers’ habitat. She found a suitable vantage point hidden beneath the branches of a shrub. It would not be long now. The Ground Dwellers and Tree Dwellers were busy this time of year when the trees shed their leaves and fruit. Watching the stone wall, she saw her target emerge, pausing a moment at the entrance of its burrow. Her sharp eyes tracked the Ground Dweller as it darted to the top of the wall and ran along its rim. She followed, creeping slowly, staying low to the ground, careful not to disturb the thick blanket of fallen leaves. Watching her prey forage, Sheahanna’s body stiffened, masking her racing heartbeat and breath. Her muscles coiled and uncoiled. She alternated shifting and planting her feet, preparing for the inevitable chase. When the Ground Dweller called out its chirping song, she charged. Her instincts took over and her focus sharpened to the fine point of her quarry. She countered every twist, turn and dart. Through a lucky pounce her claws struck home. She seized the opportunity, sinking her teeth deep into its throat and with a sharp twist, snapped its neck. Sheahanna waited for the last beat of the Ground Dweller’s heart before releasing her death grip. She licked the blood from her lips and preened herself, basking in the glory of her kill. Collecting her trophy, she carried it back to her den. She placed it prominently at the opening and called to the Master, excited to share her most recent prize. It is dark and warm in the borough. Chicory removes the food from his cheek pouches, tucking the morsels beneath the soft nesting. Leaving the nest chamber, he follows the long corridor out to the burrow entrance. The afternoon sun is bright. He cleans his paws and whiskers while his eyes adjust to the light. It is a happy day. Food is plentiful. It is the time for gathering. Chicory hears the songs of his clan and answers with his own call. He follows his trail back to his last mark, resuming his search. He sings a territorial song when he locates a new piece of food. He hears the predator warning song from his winged brothers in the trees, but it is too late. He must evade. Run! Turn! Dart! Twist! Jump! Spin! Run! Fear fuels his flight but it also blinds and confuses him. Pain burns through his hindquarters. Struggling for freedom, he screams. The jaws of the predator clamp around his throat. The futility of resisting settles in and Chicory surrenders. In that moment, he is released from his physical body and blends with the consciousness of Earth. From this new perspective, he understands his purpose, though brief, is an important instrument in the symphony of existence. The complex interplay of the flora and fauna – the movement of the land, water, and air on the surface – the rotation of the sphere on its axis – the orbit of the planet around its sun – the movement of the sun around its galaxy’s bright center. From this place of knowing he sees that although his physical life was small and finite, his consciousness is massive and endless. He chooses to live the small life again. Instantaneously, he is in a warm dark place surrounded by the fluttering of several heartbeats, a seed in a fertile garden, growing, expanding, and waiting patiently to push forth into the light. This short story is based on the prompt to write the same story from three different perspectives. I submitted this to my writers group in December 2010. I revised it and resubmitted to my group again March 2017. What I’ve submitted for this post is culminated from all the feedback I’ve received. If you have any thoughts or comments, I’d love to hear them. May you face your fears and open your heart for all the world to see. It’s only when we open our hearts that others can be welcomed in. I loved the description of the cat (well, as a dotty old cat-lady, I would!) The tale from Honey’s point of view is poignant. I haven’t quite understood yet why the three stories belong together except that they happened at the same time. Am I missing something? Hi Penny, thanks so much for reading my story and following my blog. I appreciate the support and feedback. No, you’re not missing anything… it’s supposed to be three different perspectives of the same event, the cat catching the chipmunk. I’ve been working on this nugget for a few years now and it was just time to put it out to the world. 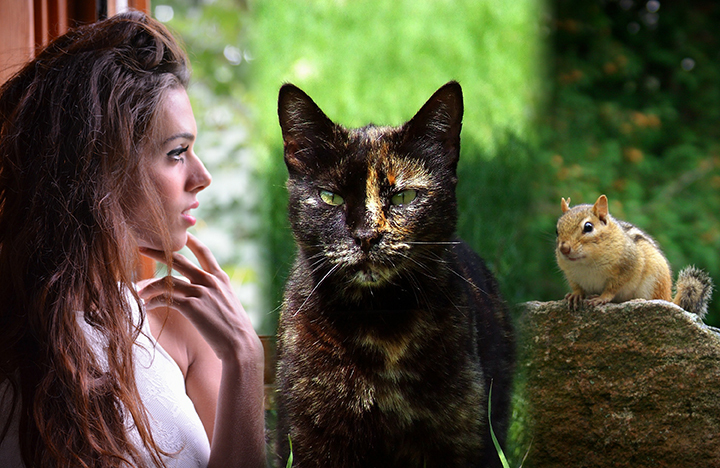 Perhaps tying the scenes together more with Honey witnessing the cat/chipmunk action… but I struggled to give it depth. Any-hoo, thanks for again for checking it out. Best!